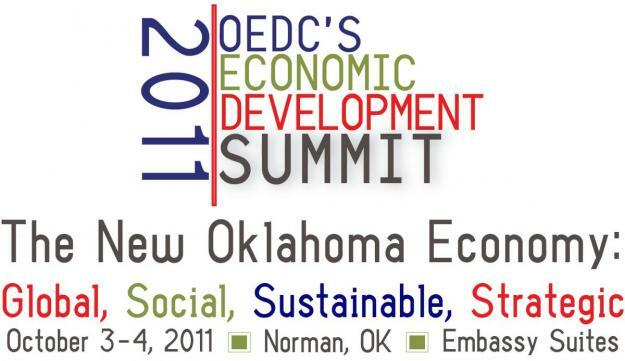 Oklahoma’s Economic Development Council (OEDC) recently held its’ annual summit, October 3-4, 2011, in Norman, OK. The title of this year’s summit was “The New Oklahoma Economy – Global, Social, Sustainable, Strategic” and, as the title suggests, our “betters” are planning the future for the rest of us. Strategic – Meaning public/private partnerships, now called strategic alliances. Generally, these are 3-way partnerships between an anchor business, academia, and the government. The anchor will generally be a multinational corporation “for the big projects”. One notable quote came from Erika Lucas, Global Business Services at the OK Department of Commerce when she responded to a question from the audience about trade policies and lost American jobs. More notes on the Summit to follow shortly. “You are part of making history today. July 14, 2011 will be one of those days that you will be able to say to your children, and your grandchildren, that you were here when history was made.” Lew Cramer, President and CEO World Trade Center Utah. 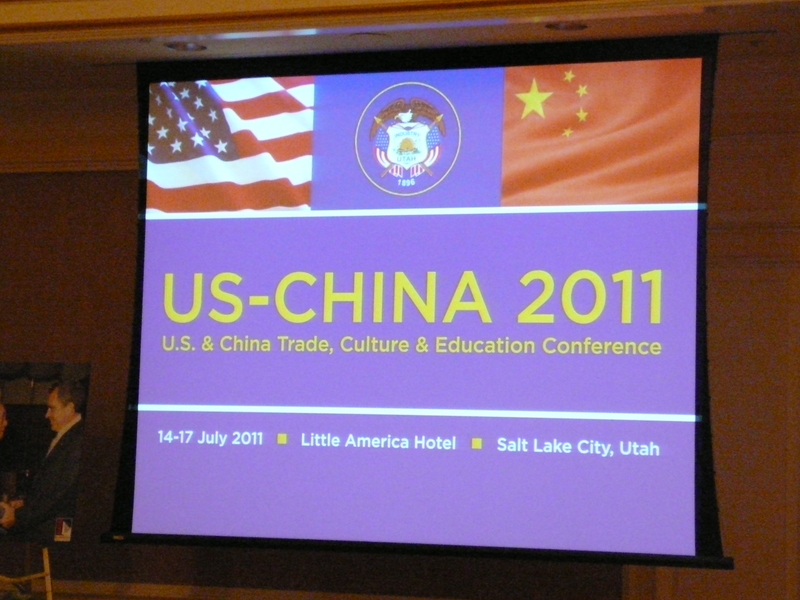 What follows is the transcript of the Opening Plenary Session of the U.S.-China Trade, Education & Culture Conference, July 14-17, 2011, held at The Little America Hotel, Salt Lake City, Utah. 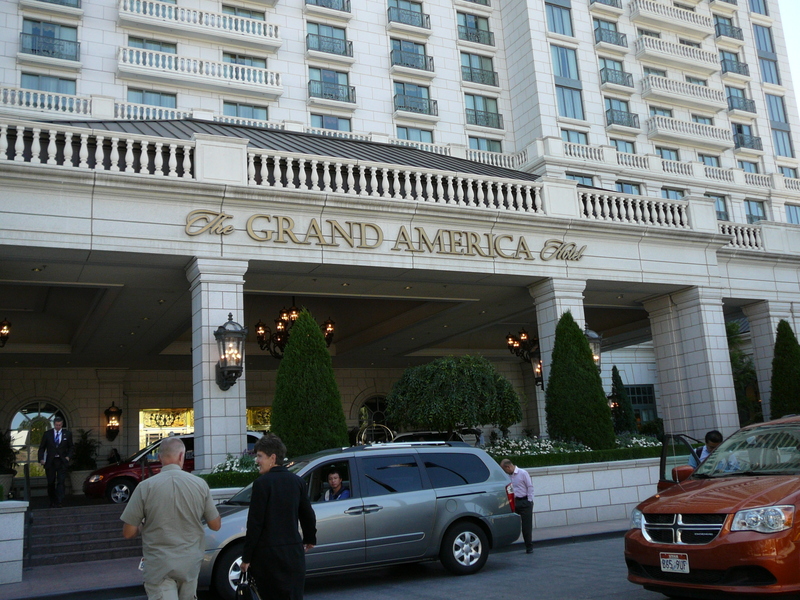 This event, sponsored by the Mormon-run American-Chinese Friendship Promotion Society, took place across the street from The Grand America Hotel, where 32 U.S. Governors, under tight security, met for the National Governors Association conference. 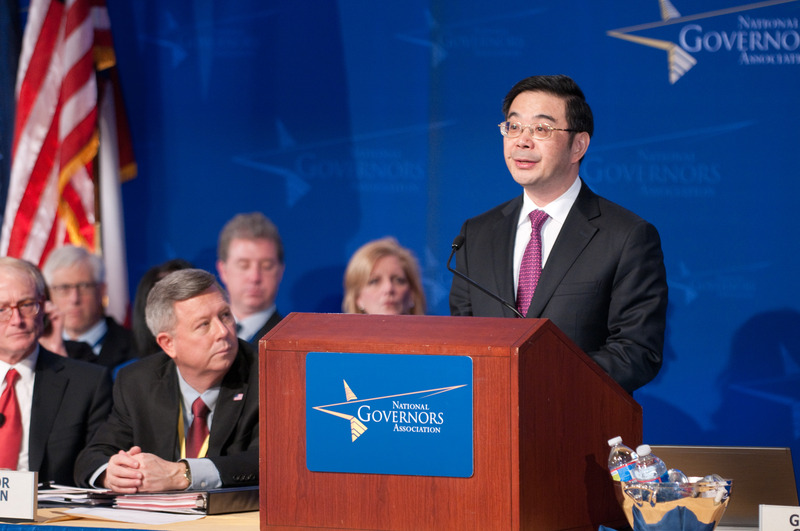 That NGA event included the first-ever U.S.-China Governors Forum (document here.) Chinese provincial leaders and Governors, all members of the CPC, spoke at both events. 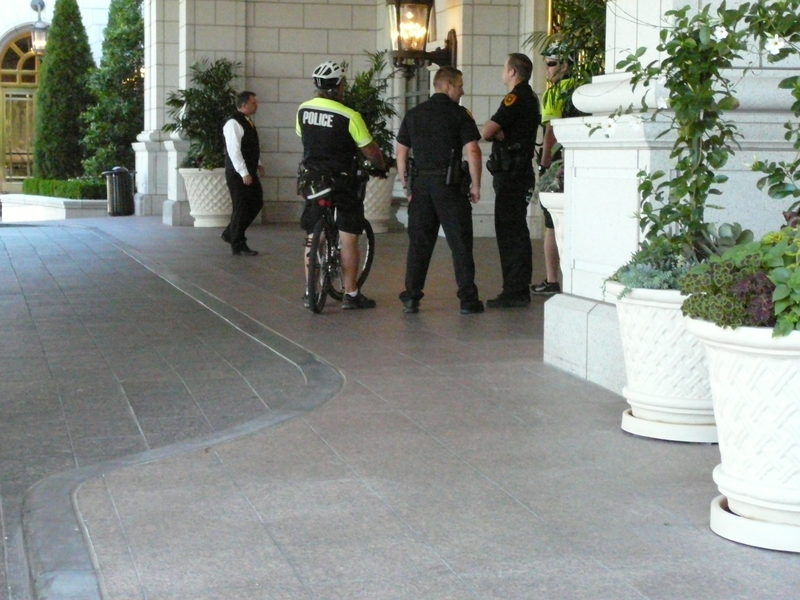 Police & security inside the Grand America Hotel, Salt Lake City, Utah, during the NGA Conference, July 2011. 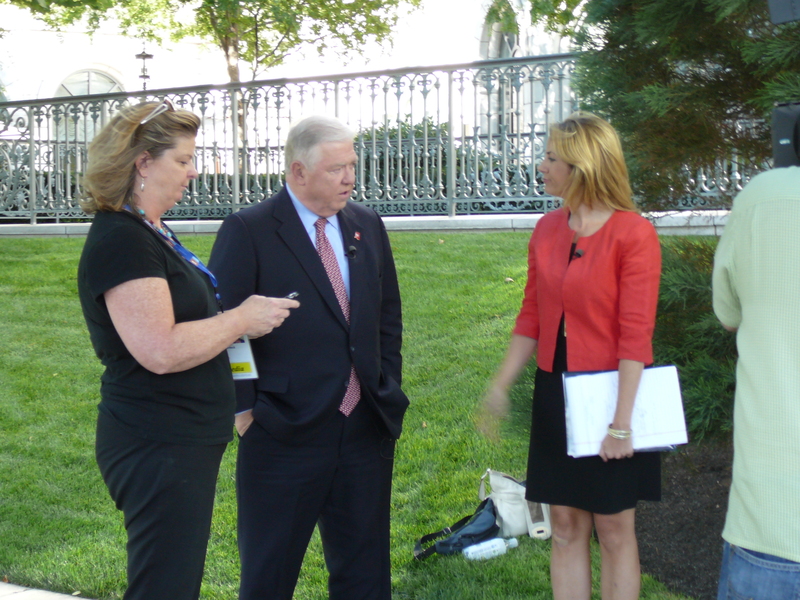 Mississippi Governor Haley Barbour being interviewed outside The Grand America Hotel, 7/14/11, while attending the NGA Conference in Salt Lake City, Utah. 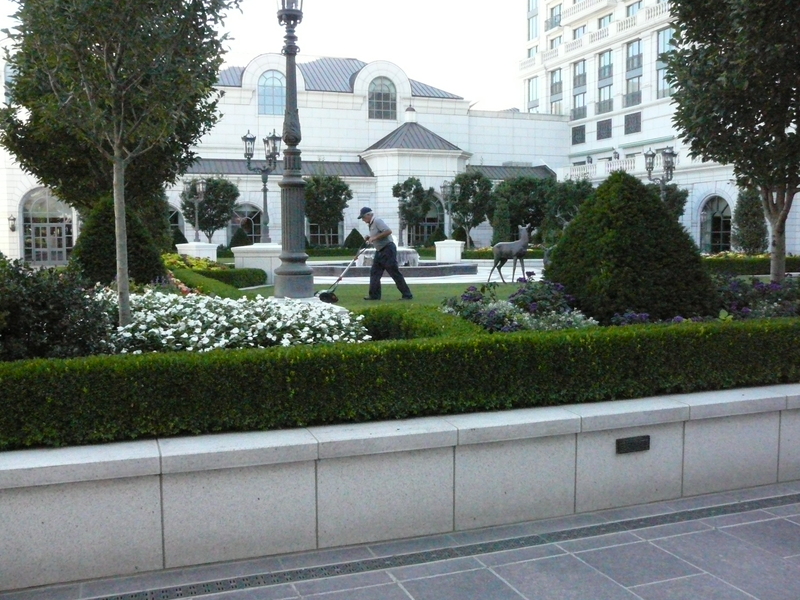 The courtyard area of the Grand America Hotel, Salt Lake City, Utah, location of the NGA Conference July 14-17, 2011. The U.S. Governors and Chinese officials met on the sequestered 3rd floor of the Hotel and in the secured conference rooms on the east side of the ground floor. 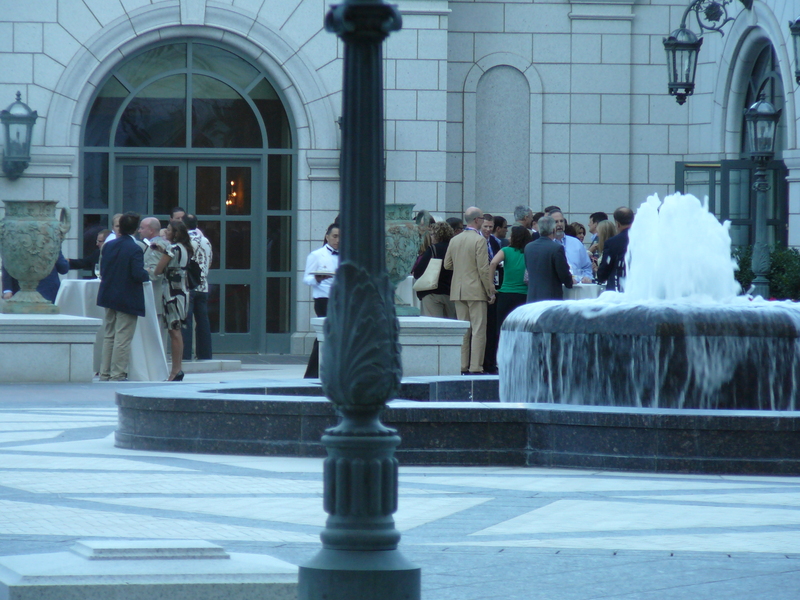 1) Photo of NGA Attendees in the Grand America Hotel courtyard, Thursday evening, 7/14/11, Salt Lake City, Utah. The NGA Event was heavily secured and access was limited to those wearing the NGA badges. 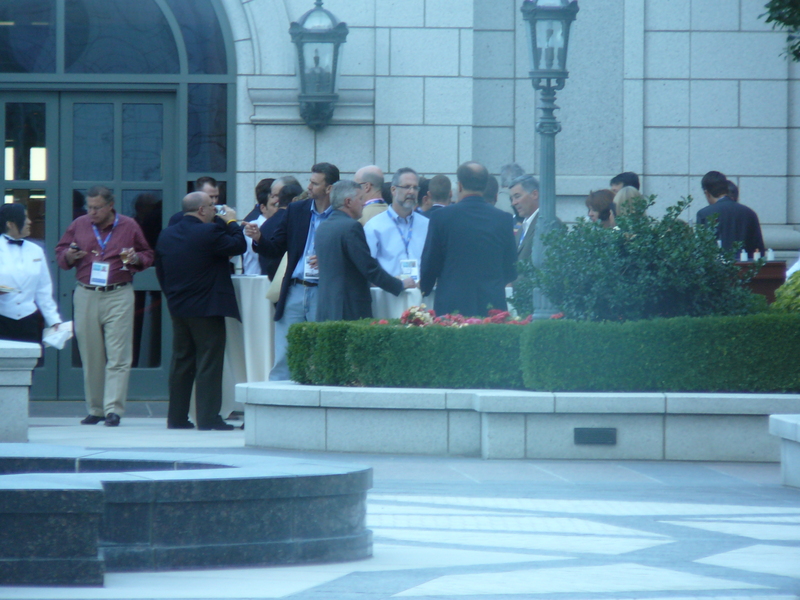 2) Photo of NGA Attendees in the Grand America Hotel courtyard, Thursday evening, 7/14/11, Salt Lake City, Utah. 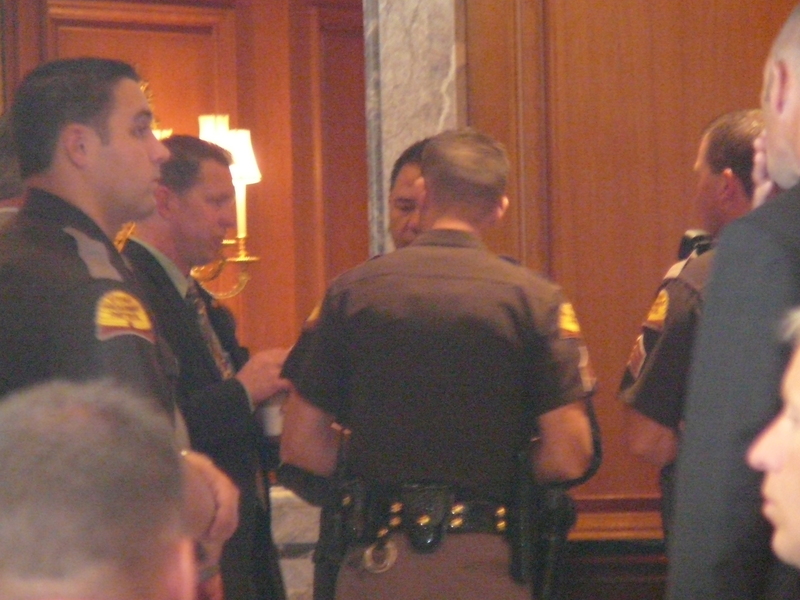 The NGA Event was heavily secured and access was limited to those wearing the NGA badges. Chinese government officials seated at round tables at the U.S.-China 2011 Trade, Education & Culture Conference, Salt Lake City, Utah, 7-14-11. 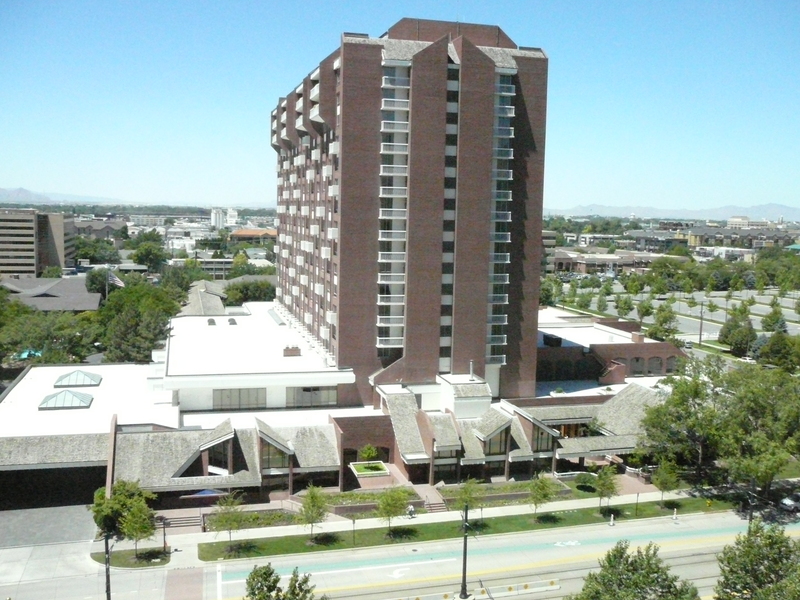 Hotels – Or The Best Little Whorehouses in…Utah? 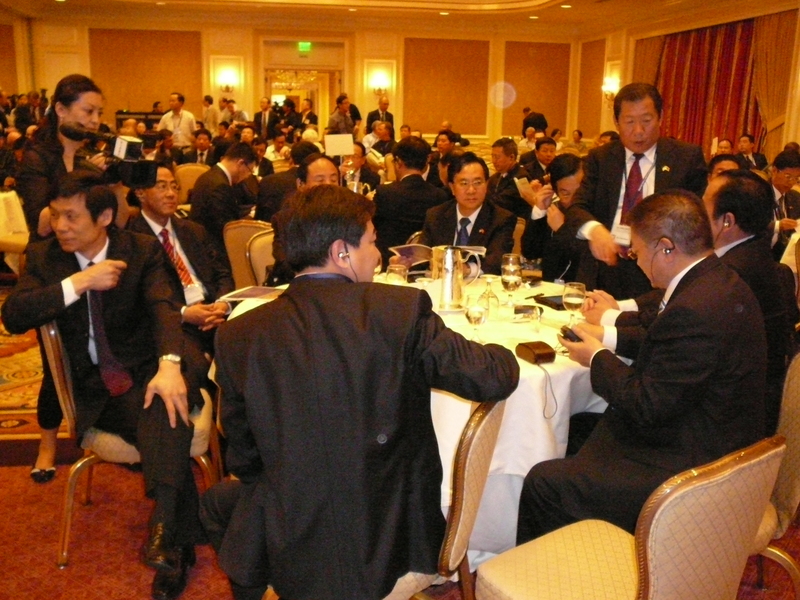 The object of both events was matchmaking; a sort of high-level, speed-dating event aimed at introducing and pairing up government officials, University R & D department heads, and Utah businesses (the “girls”) with potential Chinese partners (the “johns”) who are, after all is said and done, still COMMUNISTS. (See bios of Chinese officials below). Several Memorandums of Understanding were signed between the Chinese and U.S. Governors and Universities. Chinese media were everywhere – but some American media were excluded due to potential bias in reporting. (But the Chinese and U.S. mainstream media allowed in wouldn’t be biased? Chinese media photograph a speaker at the U.S.-China 2011 Trade, Education & Culture Conference, 7-14-2011, held at the Little America Hotel, Salt Lake City, Utah. 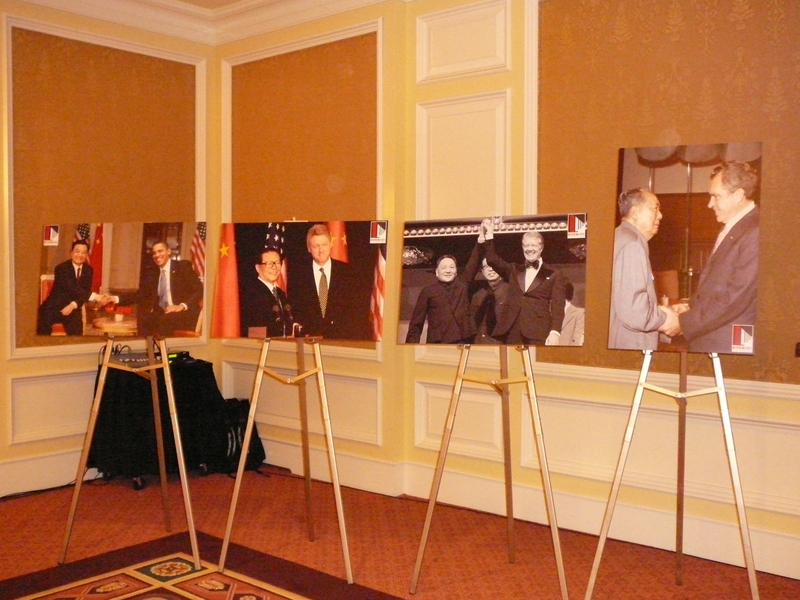 One corner of the conference room featured a row of photos of U.S. Presidents shaking hands with Chinese leaders, main conference room, Little America Hotel, Salt Lake City, Utah, July 14, 011. 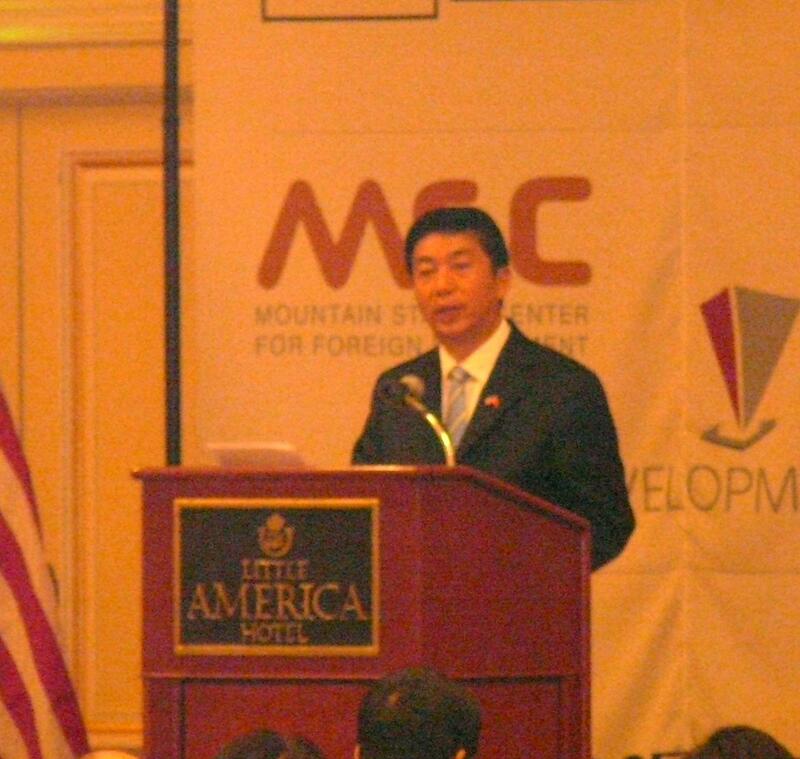 “Mister Party Secretary, distinguished Governors, Madame Li, international friends – thank you so much for joining us on this U.S.-China 2011Trade, Culture& Education Conference. 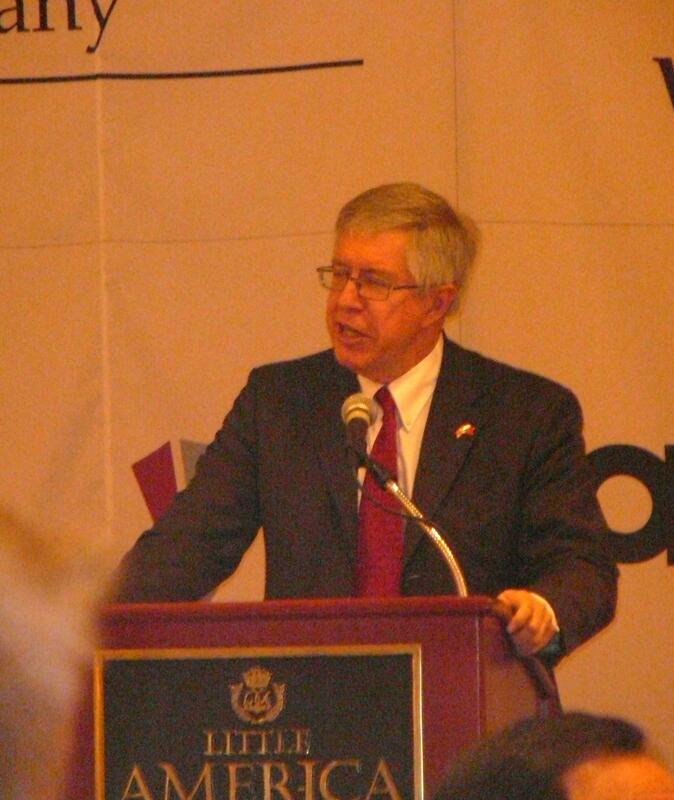 Lew Cramer, President & CEO, World Trade Center Utah..
“It is not because the Harry Potter film is premiering tonight. It is because there has never been a gathering before in this country of such distinguished guests from China. We are honored to be welcoming the leaders of four Provinces of China in conjunction with the National Governors Association meeting which starts tonight. These four distinguished guests in front of us represent, by my count, over 178 million citizens in the People’s Republic of China. Utah is in the ‘under 50 million’ category in size, so we’re grateful to have this cooperation taking place today. Uh, I can recall, I can remember my first trip to China in December of 1955, and in the many, many years since then, every time I’ve been on a trip to China it is new and expanded and exciting country. But now they have you come here and see our part of the world is a huge stride (unclear) and we extend our deep appreciation for you business. We know that most American know of Beijing and Shanghai. Most citizens in China know about New York and Los Angeles. From July 14th on we will know each other much better and know, and grasp the great opportunities that exist throughout both of our countries besides just on the coasts. We are grateful for those who have sponsored this event today; they’re listed in the program. We’re grateful particularly for the two visionaries that made this happen – Governor Herbert and Ron Hansen. You’ll hear from both of them in just a minute. This is an exciting opportunity to share in a way that has never been done before. We’re particularly grateful that you have taken the journey of many thousands of miles to share in your time with us this weekend. Our airlines are happy, our hotels are happy, and our business executives will be happy. Xiexie. (“Thank you”). We have lots to be proud of in Utah. But one of the things we’re proudest of that we are connectors and bridge-builders. Jeff, let’s show a picture of something that happened a hundred and twenty two years ago for a second, for our guests. This is a very famous picture (below) because in 1869 east and west came together; they’re connecting the two railroads that connected a continent. For the first time there our east and west were connected. This was an historic event taking place a few miles north of here. There is a lot of celebration going on and I think that many of our ancestors on both sides may have participated in this historic event. Today, July 14th, 2011, we are again joining East and West – we’re bringing China and Utah together. If you look closely there you can probably see Governor Herbert on one of the locomotives. He has been the driving force making sure this would happen. This is a day, also, of personal connections. The most important distance in international business diplomacy is the last three feet, where you look each other in the eye, shake hands and exchange business cards and decide you want to be friends and do business together. Connections exist to make us all more productive. We have used many words about this event today – “historical”, “unprecedented”,” exciting” – but at the end of the day we the word is “productive”. Many of you have seen today with descriptions of some of the events of yesterday with Qinghai. The headline says “Let the Dealmaking Begin.” We hope today that you make new friends, talk about new deals, share new ideas, and distribute business cards so it will be a very productive day for business, culture and education in Utah. I would like those who are, who could serve as translators today just to raise their hand – those who are helping translate. There are several people out there – but that is just an example the way this making connections happen. We’re going to spend much of the afternoon connecting industry sectors/interest clusters with each other and that’ll be the power of this. Governor Herbert has made a challenge to us in Utah to build unprecedented partnerships. That is what we are doing at the Governor Office of Economic Development, the Department of Commerce, the colleges, the chambers of commerce, the Economic Development corporations, the World Trade Center. Unprecedented partnerships are what make this state work so well. And Governor Herbert and I and everyone in Utah are cheerleaders for the fact that this collaboration is really working. You will hear more about that through your time here. We will hear from Ron Hansen, who will introduce the governors after Governor Herbert speaks. And let me share my introduction of Governor Herbert. I have the pleasure of spending many, many hours with him, and think he is an extraordinary leader, focused on the many opportunities for Utah, for our nation, and for our world. You’ll hear more, but under his leadership, exports in this state were the only state in the nation that doubled in the last five years. We are focused on our international collaborations. 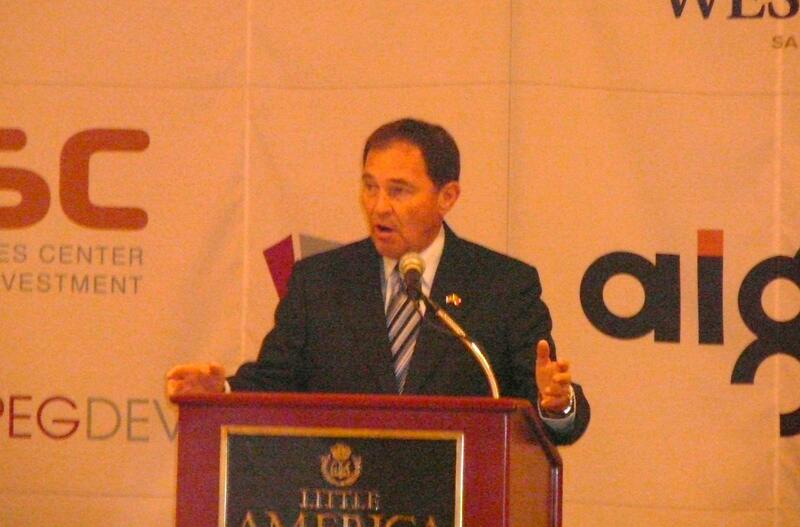 Governor Herbert has spent many years in devoted public service. He knows every square mile of this great state; he knows most citizens and most voters in this great state. He has worked with them, (unclear) with them, to not only build this state, the nation, and his most recent very successful international trade mission to China in April. The Governor’s focus is on the Es – extraordinary focus on energy, the environment, and on education. It is our pleasure to have a leader focused on international partnerships. He is our economic coordinator; he’s our Connector-in-Chief, and our chief partner in making Utah a globalized state. “Ni hau. Xiexie, Lew Cramer, thank you for that wonderful introduction. I’m honored to be here with all of you and I certainly want to express my welcome to one and all today, particularly to Secretary Zhou, our distinguished governors, our friend Madame Li and all for taking time to join us in what Lew has already said is an historic occasion for us all here in Utah. We have business leaders with us, cabinet leaders and legislators in the crowd with us – we welcome one and all today. This is truly an historic occasion, to bring Governors from two great nations together, where we’re in a spirit of mutual respect and pursuit of common goals. We’re here to forge mutually beneficial business relationships, which will create new opportunities for the people of Utah, the United States, and for China. It is important that these relationships are built upon on a firm foundation of friendship, mutual benefit, trust and collaboration. That foundation is critical to allowing Utah’s bond with China to continue to grow and to flourish. I’d like to take this opportunity to speak with you a little bit about Utah’s economic development vision and bilateral opportunities which are available to Utah and to China. We have a vision for our state, which is that Utah will lead the nation as the best performing economy, and be recognized as a premier global business destination. Our vision is steadily becoming a reality. And Utah has been recognized by leading observers around the country. We’ve been recognized as the number one state in America for business and careers by the prestigious Forbes magazine. And just this last week Fortune magazine recognized Salt Lake City’s metropolitan area as one the 15 hottest business centers in the world. These are just two of the numerous national and international accolades that we have received as of late. This recognition is not random. Our success is no accident. This is the result of a deliberate effort on our part in Utah, that makes Utah a fertile field for business and for economic development. Utah’s economic development efforts are focused on four key areas: 1) is to increase our national and international business; 2) is to strengthen and grow our existing Utah businesses; 3) is to increase innovation, entrepreneurship, creativity, and investment; and 4) to prioritize education in order to develop a workforce of the future that meet the demands of the global marketplace. As Governor my two most important two duties are creating jobs for Utahns and preparing the state economy for success in a global future. It is easy to see that the future of business is in the international arena. Perhaps the strongest evidence of that is Utah’s strengthening relationship with China. The Greater China area is Utah’s second largest trading partner, with nearly $2 billion in exports in 2010 alone, and $1.2 billion in just the first quarter of 2011. The strong trading relationships we’ve forged between our companies have created jobs both in China and here in Utah. The United States National Export Initiative challenges American companies to double exports in the next five years – to boost our economic endeavors. Along with a numerous other Governors, I have signed a letter pledging my whole-hearted support for this initiative. I have been (unclear), as Lew Cramer has just mentioned. Utah already has a stellar track record in the exports arena. Utah is the only state in the nation which has doubled its’ exports over the last five years. And we’re well on our way to doubling them again over the next five years. Utah has been able to increase their exports even at a time of economic recession here in the (unclear) country in the world. Exports have been growing at a faster rate than at any time in our history, and faster than any other state in America. Utah’s $14 billion in exports supports nearly 8,000 Utah jobs. Thousands of Utah jobs have been created and are maintained as a direct result of our trade with China. On behalf of the people of Utah, I beg you for your continued partnership with Utah. It is this partnership that inspired my recent trade mission to China. I led over 20 companies on my trade mission with the sole purpose of creating and exchanging business relationships between Utah and Chinese companies. I led the Chinese trade mission in order to facilitate opportunities for Utah companies to have one-on-one meetings with government officials and potential partner companies in China. We understand that for many Utah companies which do business with China having positive working relationships with Chinese regulatory agencies is crucial for success. For example, we were able to facilitate meetings between Utah companies and our life science sector and the representative of China’s Food and Drug agency. Utah has strong and vibrant life sciences, pharmaceutical and medical devices industries. These meetings were critical first step for these companies to move forward with positive business relationships in China. Our trade mission also helped to cement existing technology and research partnerships between a number of Utah and Chinese companies and our Universities. Researchers, engineers, and innovators from China and Utah are working in concert to solve some of today’s most complex problems, particularly in the area of energy development, and environmental conservation. These joint solutions will lead to business opportunities, will lead to business opportunities and jobs both here and in China and will ultimately benefit people all over the world, as Utah and China technology is adopted in all corners over the globe. Not only is Utah a great partner for China it is a great market for China. In 2010, Chinese imports to Utah totaled $1.4 billion. Utah provides a welcoming environment for foreign products, business and direct foreign investment. Utah has been called the “Crossroads of the West”. This is partly an historical reference, as Mr. Cramer has just talked about, with the joining of our trans-continental railroads, just an hour and half drive from here in the north of Utah. But this is also a place not only where the East and the West come together on the railroads, but its’ also a place where we are now a geographic hub and a gateway, and a coming together, a crossroads, for business development in this country and in the (inter-mountain west) in the United States. Utah has a unique business friendly population. Utah has one of the most highly educated workforces in the country. Utah also has the highest percentage of people with second-language proficiency in the United States. We were also (one of the first states) to standardize foreign language immersion programs in our public schools. Today, for example, Mandarin Chinese is taught in 38% of Utah schools. It is now the third most popular language choice for Utah public school students, recognizing the importance of China in the global market place. Utah’s (unclear) Universities also offer program to obtain business-level Mandarin proficiency. Utah is a great location for business; it has great people for business, and the right policies for business. Utah is a safe landing zone for foreign investment – a clear regulatory structure, a faithful tax rate, and a long history of stable and efficient government. Utah currently supports two successful EB-5 Centers and is seeking contracts for more. An EB-5 Regional Center is an area designated by the U.S. Citizenship and Immigration Services as eligible to receive immigrant investor capital and may lead to green-card with a $500,000 investment. Utah has established a number of economic clusters which provide investment and collaboration opportunities Chinese companies and capital, including aviation and aerospace, software development, and information technologies, energy and natural resources, life sciences, financial services, outdoor products and recreation. A stellar example of a successful foreign direct investment in Utah is the Estonian company called Enefit. An area called Uintah Basin on the eastern borders of Utah has potentially millions of barrels of recoverable oil. In Enefit, we’ve partnered with a company which has the technology, commitment, history and financing to bring that oil shale to market. Utah is open and interested in developing many kinds of mutually beneficial business relationships in the energy industry, including oil, natural gas and other minerals for export and import with our Chinese partners. Utah not only enjoys increasing business ties with China, it has also enjoyed an increasing number of Chinese visitors, some of which are here today. Utah has been granted “Approved Destination Status” by the Chinese government and Utah has seen an expanded share of the 800,000 Chinese tourists who visited the United States last year alone. While we don’t have the exact figures for the number of Chinese visitors to Utah , our Office of Tourism has reported that Chinese is now the most requested foreign language for our tours at the site of the LDS Temple, known as Temple Square, just a few blocks from here, uh, located here in downtown. Temple Square is our most visited tourist attraction and now Chinese is the number one requested language. (Unclear) 100 million exit Visas will be granted to Chinese citizens for destination all over the world in the next decade. We hope here in Utah that the largest number of those travelers will make their way to Utah and know that they are welcome. Again, we are honored to have you here in our beautiful state. I am confident that your trip will bring about great things for both China and Utah. We look forward to growing our genuine friendship and building many profitable and cooperative and mutually beneficial business relationships over the coming years. As Mr. Cramer’s mentioned, we have, in my administration, stated that we want to form unprecedented partnerships. I do believe that as we work together in a unprecedented ways we create unlimited opportunities as we represent our respective peoples. It is an opportunity that is historical in its consequence – unprecedented partnerships leading to unlimited opportunities. So we welcome you to that opportunity as we work with you in an unprecedented way in forming unprecedented partnerships. Welcome to Utah. We’re honored to have you here. Thank you so very much. Xiexie. Ron Hansen, Executive Director of the American & Chinese Friendship Promotion Society, host of this event, then went on to introduce, in Mandarin Chinese, the four Chinese governmental officials. The four officials, noted below with their biographies, all made their presentations in Chinese. For some reason, the Chinese media present in the room appeared to be particularly interested in photographing the fourth Chinese Governor, Qin Guangrong, Governor of Yunnan Province -a frenzy of flash bulbs lit up when he was at the podium. 1. Luo Huining, Governor of Qinghai Province. 2. Zhao Hongzhu, Party Secretary of Zhejiang Province. 4. Qin Guangrong, Governor of Yunnan Province. After the four Chinese officials spoke, conference attendees were encouraged to take a Networking break, to meet and exchange business cards with others in attendance. This break was followed by a luncheon featuring Spencer P. Eccles, Executive Director of Utah Governor’s Office of Economic Development (GOED). Concurrent Track Sessions followed lunch, where networking was also encouraged. OK-SAFE, Inc.’s transcript of one of those breakout sessions will follow at a later date. This followed our of interview of Prof. William “Bill” Kauffman, retired, Department of Aerospace Engineering at the University of Michigan, who re-counted some of the university’s activities with regard to the Chinese – including the sharing of sensitive defense technology. Both are contributors to a site we all should become familiar with – http://www.china-threat.com. This particular video highlights the National Governors Association’s first U.S.-China Governors Forum to be held this week in Salt Lake City, Utah. Are you asking the right questions of your governor about their intentions with Chinese investment in your state? A few updates on OK-SAFE blog post Sleeping with the Enemy -National Governors Association to Pair U.S. Governors and Chinese Party Leaders, dated 6/7/11. 1) A Media Advisory issued July 8th by the Governor’s office has confirmed that Governor Mary Fallin will be attending the NGA Conference in Salt Lake City, Utah July 13-17, 2011. Up to now, calls and emails to OK Governor Mary Fallin questioning her participation at the upcoming NGA U.S.-China Governors Forum in Salt Lake City, Utah have gone unanswered. Additional emails and calls are needed now that her attendance has been confirmed – just exactly what are her intentions at this conference? Email: info@gov.ok.gov, attention Lt. Gov. Lamb. 3) Missing MOU document Found: The MOU Creating the U.S.-China Governors Forum was noticeably absent from the U.S. State Department’s website a full 6 months after its announcement. After repeated inquiries, this document is now available on the U.S. State Department’s website. Details on the OK-SAFE blog. 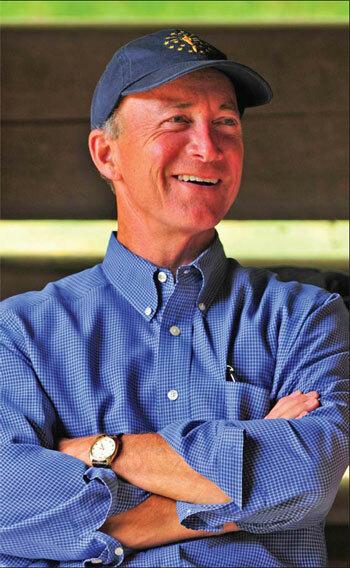 Getting it Right – “Ohio Gov. John Kasich has decided to drop out of the National Governors Association. With state finances tighter than tight, he wants to save the dues of $176,000 a year…. The Kasich administration will leave the bipartisan group at the end of this month. He will not attend its annual conference in July in Salt Lake City.” Rest here. Too bad OK Governor Fallin didn’t make the same decision. Guest Prof. William “Bill” Kauffman, Retired, Department of Aerospace Engineering, University of Michigan, President, Explosion Research and Investigation Corporation, was forced into retirement when he began questioning the University’s ties with Communist Chinese, including sharing defense technology. Kauffman is a contributor to the china-threat.com website. It is safe to say that most researchers operate as a sort of combination detective/historian. They love the thrill of the hunt and don’t mind reading what would bore most other people to death. They want to know the facts about what, when, where, how, and why certain things happen. And who did it. They seek source documents and love archives – whether the dusty boxed kind in poorly lit warehouses or the tidy electronic kind available in pdf format. Source documents and originals paperwork, necessary for sound research, is a thrill to get access to and better than ice cream. Not having to pay for it is another. Check out the Office of the Historian at the U.S. State Department website. This site and it’s contents were discovered while studying the FOIA law on the State Dept. website. The Nixon-Ford eras are important because we are living with the results of having developed intimate relationships with what were the Communist bloc countries – the Soviet Union and the People’s Republic of China. It is important to understand how the U.S. developed its current interdependency with the Chinese; this means one needs to understand Henry A. Kissinger, the man present before, during and after the Nixon-Ford years and instrumental in directing policy decisions regarding both the Soviet Union and “Red China”, as it is referred to in several of these archived documents. Kissinger really liked the communists. And still does. Click the link to historical Documents on Foreign Relations of the United States to see the four Administrations noted above. This last item – SALT I – is where the U.S. began to disarm while the Soviets built up armament. Kissinger helped negotiate this treaty. Bookmark this site – and dig in. Research on the deepening U.S. involvement with the communist Chinese revealed this: the Next Stop America China 2011 conference promoted by a members-only organization called Golden Networking. Golden is right since the focus of the conference is to instruct Chinese CEO’s how to invest in U.S. commercial and residential real estate, including a session called Leveraging Incentives and Government Relations. Just in time to scoop up home foreclosures or those urban properties local municipalities are so anxious to develop? As China transitions from a low cost manufacturing country to a well rounded economy that includes services and overseas expansion, the reality of landing your firm in America is here. If Chinese business owners and CEOs are going to heed the government’s call to become more innovative, to create Chinese brands and to take their businesses abroad, they must understand what it takes to succeed in foreign markets and in the United States, in particular. Chinese business owners have been reluctant to take their businesses to America because they are uncertain about the market requirements and rules of doing business in America. 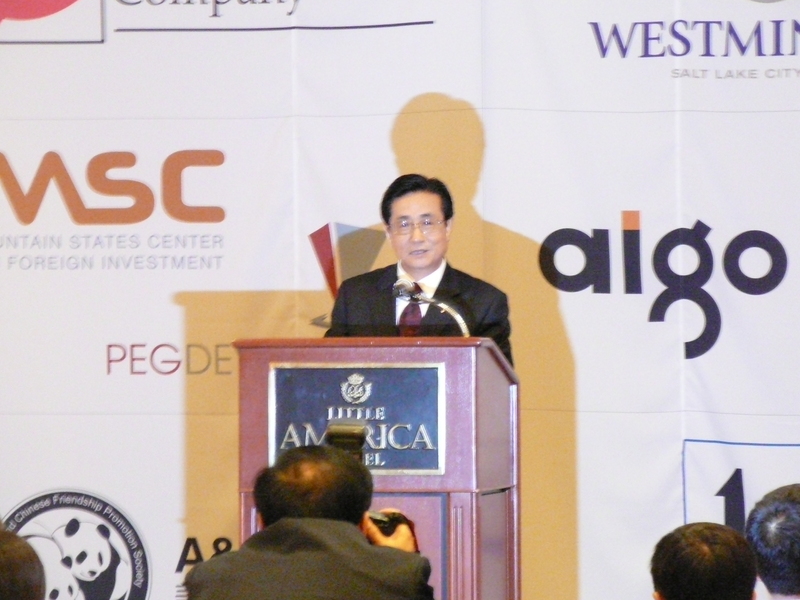 Next Stop America China Conference 2011 will address what Chinese business owners need to know to enter and to actually succeed in the United States.” End of excerpt. 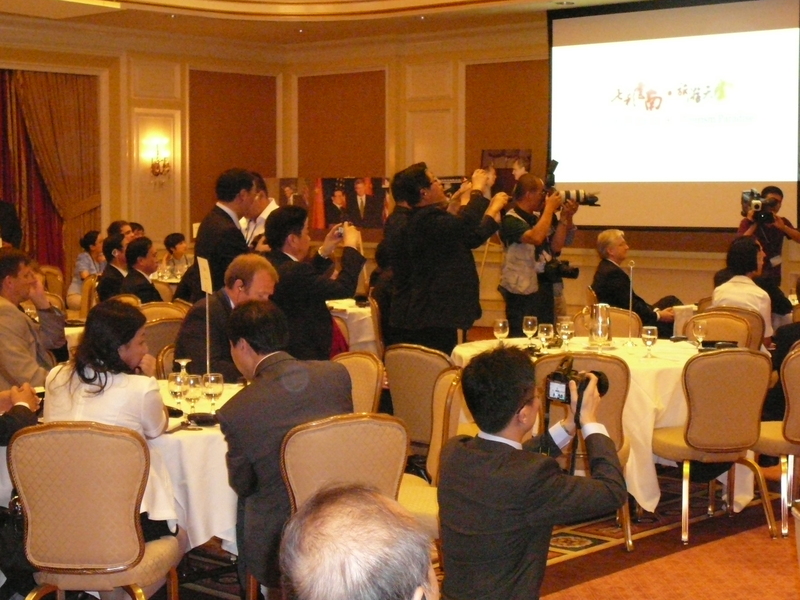 This event precedes the upcoming U.S.-China 2011 trade conference, scheduled for July 14-17, 2011 in Salt Lake City, Utah. This conference is to focus on trade, culture and education. Saturday’s agenda includes 3-hour session for U.S./China one-on-one business meetings. What a coincidence that the National Governors Association (NGA) will be sponsoring the U.S.-China Governors Forum* right across the street at their own conference with Chinese party officials. This NGA closed-door meeting includes one-on-one pairing with Chinese party officials to develop agreements on job creation, education, health and economic development. *Repeated requests for a copy of the Memorandum of Understanding creating the U.S.-China Governors Forum, announced on the U.S. State Department’s website, have gone unanswered. This effort will continue to be pursued by OK-SAFE. 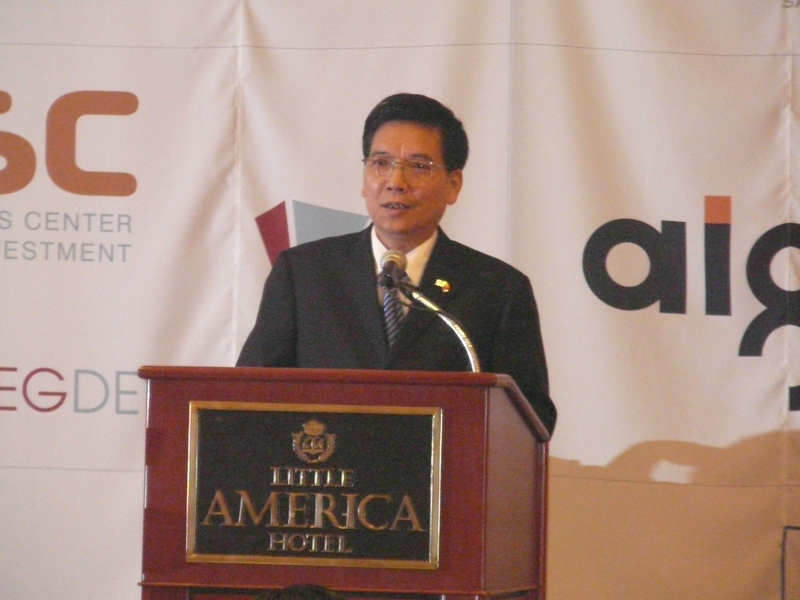 OK-SAFE 6/6/11 – U.S. Governors will be saying more than “Ni hau” (Hello) to Chinese party officials at an upcoming National Governors Association (NGA) meeting. A second session will take place in China in late 2011 or early 2012. 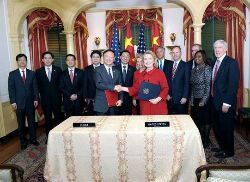 This forum is the result of a Memorandum of Understanding concerning the establishment of the U.S.-China Governors Forum to Promote Sub-National Cooperation, signed by Sen. of State Hillary Clinton on January 19, 2011. The Governors Forum will be held behind close doors. The collaboration is indicative of the deepening U.S. involvement with the Chinese government, particularly at the sub-national (state and local) level. The Rhodium Group, (RHG) has a China Investment Monitor map, indicating that between 2003-2010 there were 230 deals between states and China, totaling $11.7 Billion in “greenfield and acquisition” investments. This includes Oklahoma. According to The Rhodium Group investment map, Oklahoma has one Chinese investment so far, totaling $4 million in “consumer products”. Governor Mary Fallin, a member of the NGA’s Economic Development and Commerce Committee, will most likely be promoting more Chinese investment in Oklahoma. Oklahoma’s Dept. of Commerce promotes Foreign Direct Investment in Oklahoma. “During Hu’s January visit, the two governments signed a memorandum of understanding commissioning the CPAFFC and the NGA to create the governors forum mechanism. No amount of searching of the State Department, White House, and Chinese embassy websites has revealed the actual Memorandum of Understanding document. A FOIA request for a copy of the MOU has been submitted to the State Dept.’s Office of Global Intergovernmental Affairs. 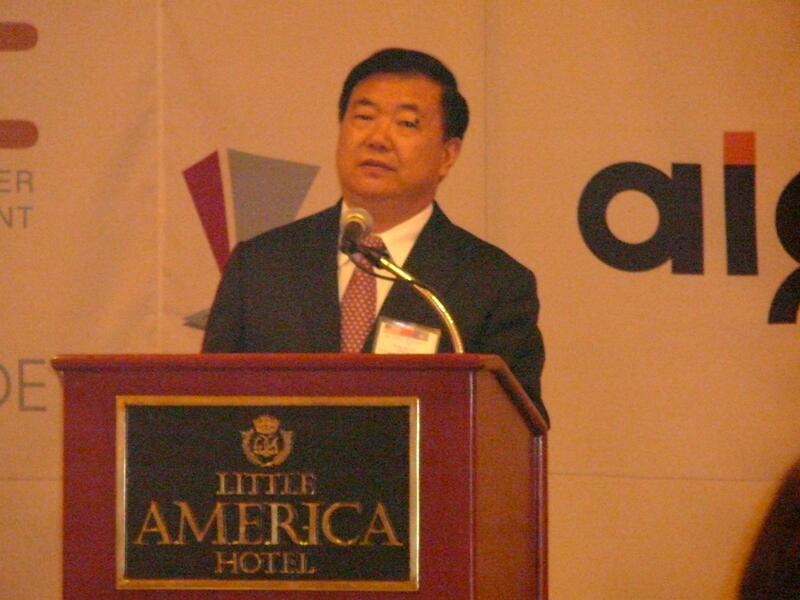 The 2011 NGA Winter Meeting , held in Washington D.C. featured Zhou Qiang, Party Secretary, Hunan Provincial Committee, pictured above. Zhou encouraged increased sub-national cooperation. Photo Source: National Governors Association. What are the intentions of the Fallin administration regarding expanding Chinese involvement in Oklahoma? Does Gov. Fallin intend to partner with a Chinese party official at the July meeting in Salt Lake City and seek increased “sub-national cooperation”? Does Fallin intend to encourage Chinese foreign direct investment in Oklahoma or seek public-private partnerships with the Chinese in developing Oklahoma’s infrastructure? These and other questions need to be answered by this “conservative” governor. What’s wrong with this picture – besides everything? China (aka The People’s Republic of China) investing in Idaho, China investing in California, China owning the U.S. ports operations. Anyone else see a trend?